December is a great month for restrepia species. These small growing plants produce lots of flowers, throughout the year, from both old and new leaf axils and add real interest to any collection. 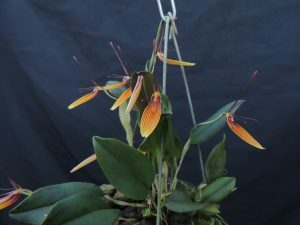 Restrepia striata is one of our favourites with medium sized (3cm) flowers produces in profusion well clear of the leaves and giving a lovely display. The species is native to South America where it is found from Colombia to Peru in wet forest from 1200-3000m. We find this species straight forward in cultivation as it seems tolerant of a wide range of light levels and temperatures. We grow it in Coll Americas and enjoy flowers throughout the winter months. We find plants do well mounted, in baskets and in pots. Plants are easily propagated from leaf cuttings (a leaf and stem) potted into moss.